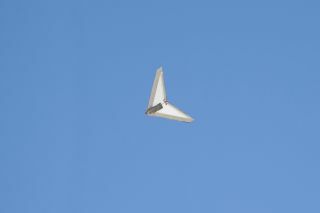 The Preliminary Research Aerodynamic Design to Land on Mars, or Prandtl-M, during a test flight at NASA's Armstrong Flight Research Center. Over the past two summers, students worked on the concept leading to successful flights. NASA student interns have successfully flown a prototype of a tiny, remotely controlled aircraft that could one day glide through Martian skies and send information back down to Earth. The group of students, who come from community colleges, spent their summer designing the aircraft at NASA's Armstrong Flight Research Center in Edwards, California. On Aug. 11, they put their design to the test. Last summer, a different group of student interns initiated the Martian airplane project, dubbed Preliminary Research Aerodynamic Design to Land on Mars (Prandtl-M). This year, the second group of students continued on the project by improving on the design, before ultimately testing its flight capabilities. "The first successful flights felt like a huge relief," John Bodylski, an engineering student at Irvine Valley College in California, said in a statement. "While we still plan to perfect the design, it is a pretty exciting feeling to realize that the aircraft is working." Derek Abramson, Justin Hall and Alexander Flock position the Prandtl-M glider aircraft onto the Carbon Cub that drops it from an altitude of 500 feet (150 meters). To test how the aircraft would perform in Mars' atmosphere, the team attached it to a balloon that carried it to about 100,000 feet (30,500 meters) in altitude. Here, the air is about as thin as it would be in Mars' atmosphere. The aircraft is about the size of a kite, with a wingspan of only 2 feet (0.6 m). "What we like about small prototypes and this student program is, this is real research, real cutting-edge technology development," said Dave Berger, manager of education activities at NASA Armstrong Flight Research Center. The students "can work on all the major areas of aerospace engineering, such as controls, aerodynamics, structures and instrumentation, encapsulated in one project," Berger said. "The program is small enough that we can design and fabricate very fast, and we can try something that no one has ever done before," he added. Al Bowers, chief scientist at NASA Armstrong, said the team still has some work to do before the aircraft would be ready to go to Mars, but they hope to see their glider hitch a ride to the Red Planet on the next rover mission, Mars 2020.